Field Day Games & Activities for the Best Field Day Ever! The sun is shining, the field is emerald green, it’s outside play ALL day and the end of the school year is in sight - Field Day (also called Sports Day or Spirit Day) is one of the most beloved and memorable end-of-school celebrations for kids of all ages. Check out our tips and ideas below to help make this year’s Field Day/Sports Day the best one yet! When it comes to organizing your school’s Field Day, the goal is to keep it fun and eventful without exhausting everyone involved. Games make the day more fun! Both traditional and inventive outdoor Field Day games will make yours a sensational blast kids will be talking about for weeks! Simple or elaborate, the best Field Day games use items you have readily available and provide opportunities for the kids to get soaked! Add creative twists to your games. Use a timer and a loud air horn to randomly end any games in progress. When the horn goes off, all teams switch to a new game area. Starting the new game immediately means no one may ever really win, but they’ll have too much fun to care! New Creative Games Make Everyone Laugh Out Loud! Chicken Sticks Relay: Grab a rubber chicken from a bucket using drum sticks and run it across the field and deposit it in a different bucket. Pass the sticks to your team mate and they bring it back. Pizza Box Race: Start with a stack of 10 empty pizza boxes for each team and teams of 10 kids. Two kids at a time run the pizza boxes to a finish line and stack them, first one box at a time, then two, then three then four. There must be 4 hands on the box(es) at all time (2 kids). When all 10 boxes make it to the finish line, the team elects two kids to bring the entire stack back – as fast as possible. Plunger Challenge: Start with 4-8 plungers. Kids pass a ball back-and forth as many times as possible. Younger kids do this while standing in a circle, older kids while running toward a finish line. Kids compete for lowest score - one point is awarded each time the ball hits the ground. 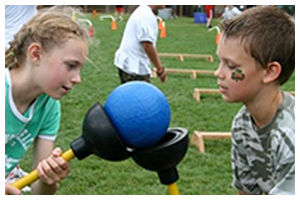 Water Shoot Out Relay: Using a high-power water gun, kids try to knock a foam ball off a cone some distance away. For older kids, have teachers or a parent squirting a stream of water back at the kids – they’ll try to squirt the adults defensively and will have a harder time completing their task. Start with the filled water blaster some distance from the starting point in a hoop on the ground. Kids have to run to get their ‘weapon’ and then replace it in the same hoop – refilling before putting it back. Soaking Wet Sweatpants Relay: Prepare two pairs of adult sweatpants and two buckets of water. Divide into two teams, first person up, dips the sweatpants into the bucket completely drenching them. Then puts them on and runs to a designated marker and back. Takes the pants off and hands them to the next kid who also dunks the pants and puts them on. And so on till the last kid on the team makes it back. 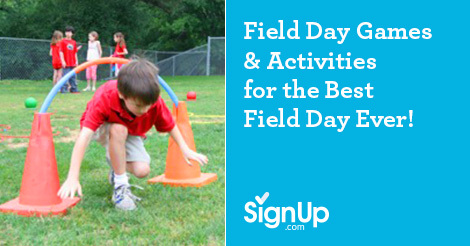 The Classic Field Day Games Never Grow Old - Try These Tried-and-True Favorites For Your Upcoming Field Day This Spring. Parachute game: Popcorn: Toss multiple small rubber balls on the fabric while held taut, see how long your team can keep them popping! Three-legged race: Divide into teams of 2, tie up with ribbon and race in groups of 3 around a traffic cone back. Egg and spoon race: Set up relay teams and give each child a large spoon from the cafeteria. Carrying an egg, students race to transfer the egg to the next child’s spoon, and the next, finally to the finish line. Try different types of objects to carry such as giant marshmallows, ping pong balls, potatoes. Older kids can try with chopsticks instead of spoons. Sack race: Line up all the kids inside burlap sacks, or old pillowcases, hop to the finish line, first 3 win. Obstacle course: Get creative with your obstacles. Find ladders, garbage cans even classroom chairs, to crawl over, under, around and through. Tug-o-war: Find a soft rope and tie several knots in each side. Divide into teams and place a large puddle of water or a colorful ribbon in between the teams. First team to touch the water or cross the ribbon loses. Sidewalk Chalk: Bring buckets of colorful sidewalk chalk and designate an area for free-form fun. Pirates Treasure: If there is a sandbox or digging area, bury pennies and small prizes to be discovered. 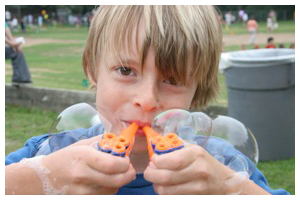 Bubble Bonanza: Set up a bubble blowing station including individual small bubble blower and buckets and supplies for making extra large bubbles. Stacking Cups: Kids will enjoy competitive or free-form tower and castle making with colorful plastic cups. Hoop it Up: Have stacks of colorful hoops on hand for kids to enjoy. Free Online SignUp Sheets by SignUp.com make it a snap to arrange activity station helpers, snacks and plenty of volunteers to set up and clean up. Try it now! Encourage each class to pick a theme, create a custom cheer and wear simple costumes on Field Day. Not only does this help adults easily identify kids for activities - classroom spirit will be the highlight of the day for many: Ms. Cunningham’s Clowns, Mr. Rice’s Rockers, Ms. Newton’s Nerds. No costumes? Ask students to wear the same color t-shirts for the day or provide a colorful ribbon for each child to wear. A day outside the classroom filled with fun is prize enough, but here are some cute and creative tokens for students to remember all of their Field Day experiences. Reward teams with different color beaded necklaces, rubber-band bracelets, printable certificates, or small ribbons attached to safety pins to indicate how they placed in each event. Pick winners in many categories - the craziest costumes, loudest cheer, most original theme, fastest class, wettest class… the zanier the better. Match prizes to the category - for the fastest class, give them small plastic cheetahs, for the silliest, cover them in Silly String at the end of the day. For an ‘ice-breaker’ winner hand ‘em a cup of ice & allow the winner to dump it down a teacher or volunteer’s back! Make sure everyone’s a winner by handing out consolation prizes like small temporary tattoos, stickers, pencils and small plastic animals. Set the Date - get your Field Day on the school calendar as early as possible and reserve a backup date in case of rain. Assess the outdoor spaces - will you use the entire sports field and recess areas? Where are hoses and easy access to water spigots? Is there shade or will you need to order large tents for rest areas? Are any areas unsafe or under construction? Choose Field Day activities, games and prizes. Think about using readily available props and equipment from the P.E. department and inexpensive or donated materials. Talk up Field Day with teachers and have each choose a classroom theme. 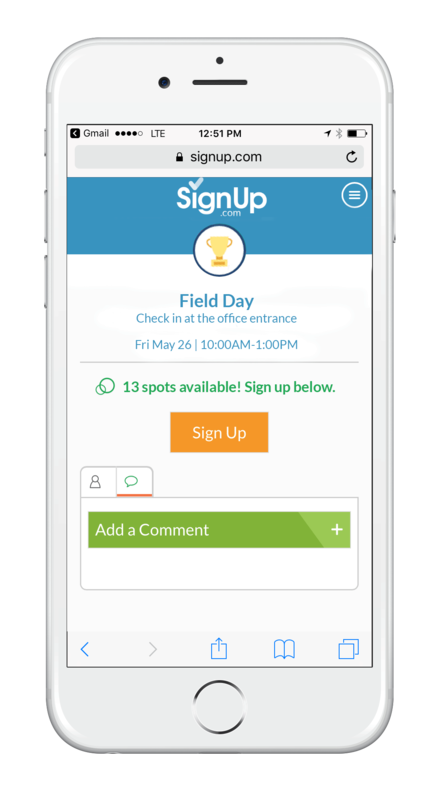 Create a SignUp.com (Field Day volunteer sign up sheet) and invite parent and high school helpers to pitch in. Free and easy online Signups and automated reminders ensure you get the support you need to successfully people-power your event. Map out (and then walk out) where each game and activity will take place providing enough space for the game itself and for the students waiting for their turn to participate. Order shade tents, if needed. 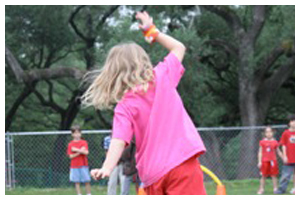 Promote Field Day in your school newsletter and social media channels. Put out additional calls for volunteers as needed. Complete shopping for snacks, prizes and props. Prepare signs and banners for activity stations, volunteer check-in, and scorekeeping (if your school likes to keep score). Print an instruction sheet and time table for each activity station volunteer. Include step-by-step instructions for how the game is played and any modifications or accommodations by grade or class. Put each one in an individual plastic sheet protector clipped to a clipboard for easy access. Pre-package each activity/game into a ‘kit’ including all supplies plus things like stopwatches, clipboards, markers, whistles, megaphones and instruction sheet. Plan the activity rotation schedule including how much time each class will spend at each game station, where each class will start, and when and where rest and rehydration time will be. Share classroom themes with students and have them brainstorm easy costumes and simple spirit cheers. Alert parents to help their kids prepare for Field Day including figuring out what to wear, putting on sunscreen (and packing extra) and packing appropriate snacks. Send last-minute requests to volunteers. Arrive early to set up activity stations and signage (with the help of volunteers). Greet and assign volunteers to their stations. Review game/activities rules and timelines. Greet classes at the appropriate time and invite a cheer from each class and have them share their theme. Share the day’s game plan and safety guidelines. Ask the principal or other volunteer to share periodic news and updates over the PA system or megaphone so everyone can hear and cheer. Refill water stations and snack stations to keep them fully stocked. Monitor kids for sun and heat safety, calling for extra breaks if needed. Assign a volunteer to take photos and video to share (following school guidelines). S/he can also keep a headcount on the kids and monitor stragglers. Have fun and celebrate the joyful chaos - the kids will be having fun, no matter what! Clean up with the help of volunteers, putting the outdoor areas back to their original condition (or better) and restoring all props and equipment to their proper places. Thank all volunteers and supporters for their time and hard work. Take notes on what worked well and what you want to modify or change for next year. Share photos and videos with the planning team and appropriate classroom teachers. Rest well - you’re a hero and brought joy to many! Sign on high school student helpers and parent volunteers for the ultimate school day of fun! Field day takes an army of volunteers to setup, run hundreds of kids through activities, and clean up. Save time and energy getting everyone organized with SignUp.com! Set up your simple online sign up sheet with a list of volunteer needs (eg. station supervisors, people to bring snacks & water, helpers to set up and clean up) and invite parents to pitch in (via the school newsletter, email, Remind (text), or post a link on your school’s website or facebook page). Parents will sign up from their smartphone or computer with a few clicks - no password required! Calendar sync and automated confirmation and reminder messages sent by SignUp.com help everyone keep their commitments. Prefer to give each classroom or grade a specific responsibility for planning and staffing your Field Day stations? Easy! SignUp.com’s Quick Copy feature makes it a snap to duplicate a SignUp sheet and share it with lead classroom parents to recruit helpers. Keep safety details in mind when planning Field Day so everyone has a fun day with no surprises! Sun Supervision: Plan rest-activities in shaded areas throughout the day and have high SPF sun block on hand for kids who may need it (school rules permitting). Hydration: Set up specific water stations and times where kids can get a drink or popsicle and a break enjoying fun individual activities such as blowing bubbles, stacking cups, hula hooping, or chalk drawing. Snacks: Plan for filling snacks that won’t leave kids crashing after the sugar wears off – granola bars, sandwich bites, trail mix, orange slices. First Aid: Be prepared with a fully stocked first aid kit and the school nurse on hand for emergencies. Bathroom Check: Follow school safety protocols such as the buddy system for bathroom breaks and consider assigning a volunteer to monitor the bathrooms and ensure kids return quickly to their class’ activity station. We wish you a fun and memorable Field Day! Please share your experiences on our Facebook page so we can celebrate your success!